Chateau La Cour dates back to the 13th century and is the largest and oldest property in the area. The house has been painstakingly restored, retaining many of the original features, but without compromising on comfort. We are just 25km South of Caen and ideally situated for exploring the Normandy landing beaches, Bayeux, Deauville and Honfleur. It is an excellent base for outdoor activities, walking, golf, horseriding or visiting the many chateaux and gardens in the area. The Suisse Normande is an area of peaceful rolling hills and attractive wooded valleys, where cattle graze in apple orchards that have changed little over the years. The bathroom is the undoubted star of the show - a place to pamper yourself! The centrepiece is a free standing bath with spectacular views. There is large hydro massage shower, twin hand basins and separate toilet. The living room area has comfy linen sofas to relax in, sophisticated lighting and elegant soft furnishings. Flat screen TV with UK channels by satellite. DVD recorder/player. The dining table enjoys views over the Suisse Normande. The corner kitchen is a showpiece of stainless steel and top quality equipment. Smeg hob and dishwasher and state of the art multi function oven with microwave. There is a fridge. All the kitchen utensils, crockery and cutlery are of the highest quality. The tourist office states that there are 14 golf courses within an hours drive of the Suisse Normande, including the famous Omaha beach golf course. Notes on accommodation: The perfect accommodation for 2 adults. No children or pets. A non smoking house. Outside: The garden is an excellent place to sit and relax and watch some of the wild birds that have also made Chateau La Cour their home. There is a variety of tables, chairs and benches around the garden. Also, a south facing walled potager which features obelisks, raised beds, standard roses and lots of decorative vegetables, very much in the style of traditional French potagers. Sun loungers are also provided. Utility Room: Laundry service available. Iron and ironing board. Vacuum cleaner and cleaning materials. Cleaning / Towels / Linen / Maid service: Egyptian cotton towels and bed linen are included. There is weekly cleaning and change of towels and linens. Additional cleaning services are available at the prevailing hourly rate. Other: Access by the main entrance hall and private stairway to the apartment. We have stayed for a week in Le Jardin apartment of the Chateau de la Cour, a beautiful chateau sympathetically restores by the owners Lesley and David. The apartment has its own front door and is very private, spacious and beautifully decorated with high quality furnishings. The kitchen is equipped for a chef and the lounge area is very comfortable and relaxing. The bedroom is very spacious and the bathroom is exceptional with a large shower, free standing bath and his and hers sinks and separate toilet. The L’Occitane bath products provided with soft towels and bathrobes make you feel like you are staying in a five star hotel. With attention to detail that goes above and beyond it really is up there in one of the most exceptional places we have stayed. There are views to die for from every window and lots of areas in the gardens to sit and admire the view over the surrounding countryside. This is a part of the Suisse Normande that we cannot emphasize enough you should visit. Beautiful rolling countryside, amazing history, gorgeous beaches and cuisine gastronomique! We liked it so much we picked up brochures for local houses to buy!! You are spoiled for choice in places to visit and dine out or if you prefer the owners offer a come dine with them experience- our only regret on this visit that we didn’t partake. Lesley and David are wonderful hosts, engaging, inspiring and helpful. We will definitely go back and would highly recommend this to anyone visiting the area. This was an attractive, high specification apartment, within a tastefully restored property. It is set in beautiful grounds, surrounded by wonderful countryside. The owners are friendly, welcoming and helpful. If you want a peaceful, relaxing holiday in the heart of the countryside, this is the place for you. We spent a wonderful week in the apartment at Chateau La Cour and what a treat it was! The apartment is large, extremely comfortable, beautifully decorated, and offers first-class amenities. The Chateau's location makes it an excellent base for visiting most of the major sites in Normandy. The beautiful gardens and countryside surrounding the Chateau provide all the rest you could want after a day out and about. And to top it off, Leslie and David are the perfect hosts - gracious, charming, and helpful. Their hosted dinners, which took place in their lovely dining room, were a real highlight of our stay. What a special way to enjoy fine cuisine and engaging company! The accommodation was exactly as shown in the photos and very clean. 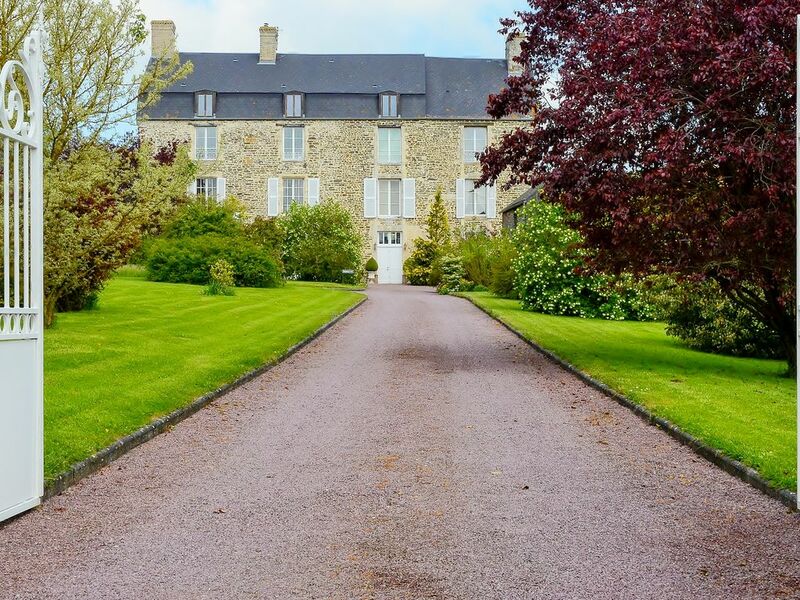 I have had a wonderful stay at Chateau Le Cour and would recommend it to anyone wanting to visit Soisse Normande. Lesley and David are the best hosts that I have had on my many years of travelling. They made me very welcome and are always available to help in any way. This property was a lovely treat for us. It is spacious and immaculate with all the kitchen equipment you might need, and wonderful toiletries. Lesley and David are great hosts who made us most welcome and answered all our questions. They also cooked us a delicious dinner which we enjoyed one evening in their company. They grow their own fruit and vegetables which were an added attraction! The apartment at Chateau La Cour is ideal if you are looking for peace and quiet, a rural location and great views (in addition to the above). So pleased to hear that you enjoyed your stay in Le Jardin, our self catering apartment at Chateau La Cour. And, that you found it equipped to meet all your requirements. Many of our guests enjoy the option of dining with us during their stay. Rustige regio. Ideale uitvalsbasis voor een bezoek aan de stranden, Caen, Lisieux, te wandelen en kajakken .... Leuke eigenaars en appartement waar alles voor handen is. Zeer net. The Normandy landing beaches, Bayeux, Caen and its Peace Memorial, Deauville and Honfleur are all an hour or less away. Mont St Michel and Monets Garden are also day trips from Chateau La Cour. A car is essential at this country location. Shops – All essentials can be found in Thury Harcourt. There are many local shops and a supermarket 'Super U'. There is a 8 a Huit, bakers and pharmacy in St Remy sur Orne just 5 minutes away. The city of Caen offers a wider range of specialist shops and hypermarkets to meet every requirement - 30 minutes drive. There are a variety of restaurants in the area. Booking Notes: Firstly check availability and rates. To confirm a booking a 25% deposit will be required together with a completed booking form. The balance of the rental charge will become due 6 weeks prior to the holiday start date. At this time a refundable good housekeeping deposit of €300 is required. This will be repaid 7 days after departure, subject to there being no charges. If the booking is is within 6 weeks of the start date the full rental amount becomes due. Changeover Day: Changeover day is Saturday but flexible out of peak season. Check-in time is 4pm to 7pm. Check out is by 10am. Notes on prices: Prices are for the property per week in euros. Rates include a Welcome pack, electricity, local telephone calls, all linens and towels.